For more than 30 years, exercise physiologists have known that the exercise intensity at which lactate begins to accumulate in a person’s blood, lactate threshold (LT), is a powerful predictor of their endurance performance ability. This is because although an individual’s cardiovascular fitness (VO2max) sets the upper limit to their rate of aerobic energy production, it is their LT that determines the percentage of their VO2max that can they can utilize for any given period of time. The physiological factors determining LT are complex, but in this context, blood lactate levels essentially serve as an indirect marker for biochemical events within exercising muscle. More specifically, a person’s LT reflects the ability of their muscles to match energy supply to energy demand, which in turn determines the fuel “mix” (carbohydrate vs. fat) used and the development of muscle fatigue. Consequently, LT, especially when expressed as a power output, which also takes into account cycling efficiency, is the single most important physiological determinant of performance in events ranging from as short as a 3 km pursuit to as long as a 3 week stage race. Just as importantly, because the metabolic strain experienced when exercising at a given intensity is dependent upon the power output relative to power at LT, this parameter provides a physiologically sound basis around which to design any power meter-based training program. TrainingPeaks.com and TrainingPeaks WKO4 software explicitly recognizes the crucial importance of power at LT by allowing you to enter a value for your current Functional Threshold Power (FTP) and threshold heart rate. This value is then used to calculate the Intensity Factor® (IF®) and Training Stress Score® (TSS®) for every file you analyze. In addition, WKO4 will use your threshold power to automatically calculate seven suggested training ranges, or levels. 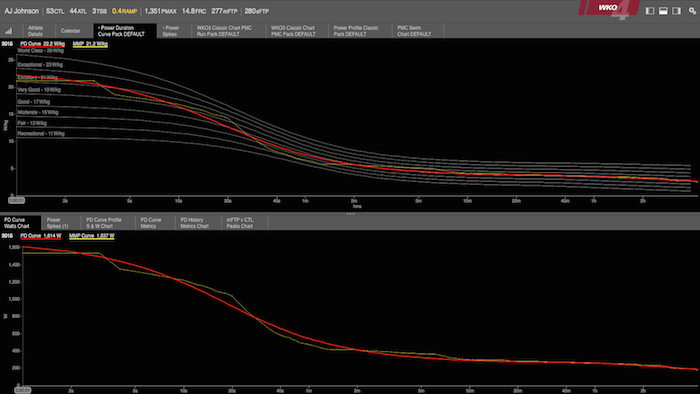 Alternatively, TrainingPeaks also allows to custom define your own power-based training levels. So, how do you go about determining your threshold power? Obviously, one way is via laboratory testing with invasive blood sampling, but few people have access to such testing on a regular basis. In addition, power at LT as determined in this manner is often significantly below what athletes and coaches tend to think of as a “threshold”. A good estimate of your FTP can often be obtained by simply uploading all of your training data into TrainingPeaks WKO4. WKO4 will take all of your historical data in order to model your current FTP. Another way of estimating your FTP without performing any formal testing is to simply evaluate the steady power that you can routinely produce in training during longer hard efforts, e.g., intervals or repeats aimed at raising LT, or during longer climbs. Perhaps an even more precise way of determining your FTP, yet one which still doesn’t require any formal testing, is to examine your normalized power during hard ~1 hour mass start races. Since TrainingPeaks automatically calculates Normalized Power® (NP®) even if you haven’t yet entered a value for your threshold power, using it to first analyze several race files may be the quickest way to deriving a good estimate of your threshold power. Since by definition the best measure of performance is performance itself, the most direct estimate of your sustainable (threshold) power will be obtained by simply doing a time trial of an hour or so. By examining the horizontal graph of the data from such a TT in TrainingPeaks (perhaps with a little smoothing applied), you will be able to quickly tell whether your effort was well-paced, or if perhaps you started out too hard and then later faded, resulting in the average power somewhat underestimating your true threshold power. Finally, those who are more mathematically inclined may wish to perform formal testing to determine their “critical power” as described in the scientific literature. Briefly, this approach consists of plotting the total work performed (in joules) during a series of relatively short (i.e., between 3 and perhaps 30 min), all-out efforts against their duration (in seconds), then fitting a straight line to the data points. The slope of this line is critical power, which corresponds quite closely with functional threshold power determined using any of the previously-described methods. Since one goal of any training program is to increase power at threshold, the value you have entered into TrainingPeaks should be periodically reassessed to be certain it is still accurate. In particular, an IF of more than 1.05, meaning that NP is more than 5 percent greater than threshold power, during a 1 hour mass start race is often evidence that your threshold power is set too low. How often threshold power will change significantly will depend in part on your training history and habits. For example, someone who is just beginning in and/or returning to cycling may see large and rapid changes in their threshold power, whereas an experienced rider who has been training for many years and/or an athlete who maintains a high level of conditioning year round will probably experience much less variation. In general, assessing threshold power a few times per year (e.g., near the start of training as a baseline, partway through the pre-competition period to track improvement, and during the season to determine peak fitness achieved) is probably sufficient.